The latest map seems to be a much needed improvement over the 1990 version, taking into account much more weather data as well as topographic land features which aided USDA researchers and scientist in creating a much more useful tool for the nation’s farmers, horticulturalists and home gardeners. On Wednesday, I sat in on a public teleconference hosted by USDA and National Arboretum officials which was supposed to be the official unveiling and tour of the new map. Honestly, this phone conference was a bit of a bust… poor sound quality, cut-outs, 100 guests like myself all trying to figure out how to use the system (when all they needed to do was sit there, be quiet and listen :)) so after about 15 minutes I said good bye and decided to instead hit the web and do some digging. This time around, the USDA did it right. They used data from about a 30 year period instead of a 15 year period AND they used data from close to twice as many weather stations which equates to 4 times the data… 4 times the data = more accurate results :). 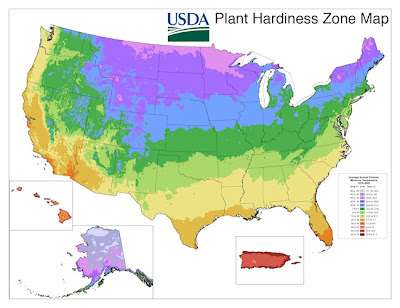 Also, a big leap forward, the Hardiness Zone Map has adopted the strategy of the great folks at Sunset Magazine whom created the Sunset Hardiness Zones based not only on historical data but also on latitude, elevation, marine influence, thermal belts, wind paterns, etc… basically all of the ingredients that go into a microclimate soup. What does this mean? A more accurate map, of course! That we are spiraling into a “prognosis negative” (Seinfeld reference) with global warming!!! No, it doesn’t, but the map does appear to reveal that we are in a warming trend. Blame it on Earth’s natural warming cycle, human intervention, the fact that the map incorporated more data… I’ll leave that to you. I have my opinions and I’m sure you have yours. So, what’s new? We’ve added a zone. Instead of the familiar 12 zones we’re now up to 13 zones and just as before, each subzone is broken into 2 5-degree subzones, “A” and “B” for a total of 26 zones. Furthermore, there appears to be a general shift of one “Zone” warmer in most areas (there are exceptions). Poster are no longer available… that’s right, at this time the arboretum is not offering poster-sized copies. Who cares? It’s the digital age, if you’re looking for wall art for the nursery office, just get some of those motivational posters from Office Depot. Besides, you can download hi-res images for free from the USDA! The new map is available as an interactive GIS-based map meaning that users can search the map by specific area code. Not overly useful but still a much needed “zoom” feature over the US Arboretums previous digital format which would only zoom in “regionally” which made the map hard to read. No problems now! Well…it really isn’t all that relevant. Albeit a great reference tool, I doubt that this will have much if any impact on the horticulture industry. Most folks in our industry operate on a local or regional level and they know their weather trends like the back of their hand. Producing a map that shows a Zone shift to a warmer America is telling us something we already know; this just sort of makes it official. Growers and gardeners alike will continue to push the hardiness of plants (from both south to north and vice versa). Grower/gardener experience and the exchange of these experience will continue to shape your own local plant palette, not this. So while it is a big improvement, and a convenient GENERAL reference, the Zone map will likely remain as fodder and space filler for nursery catalogs and little more.